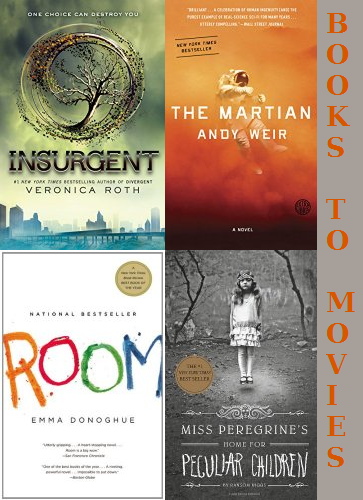 I've recently seen several lists of books that are being made into movies in 2015. It seems there are a lot more than usual this year, or perhaps I just haven't noticed this trend in recent years. As I read through the many lists, I found 10 books that I've read (or am going to read soon). All of these will be released in theaters in the next year or so, and I'm very excited to see just about all of them. If you haven't read the books yet, get to it before the movies come out! I haven't read and reviewed these last two yet, but they are my book club's February and March books, so I'll be reading them soon! Some I've read, and am looking forward to the movies. I've read a few of these books and have some movie watching to catch up on too. Oh, Me Before You will be a good book club discussion book, bring plenty of kleenex when you read it! Thanks for the warning! I'm looking forward to discussing some good books this year. We have the first few chosen and I've heard great things about all of them. I absolutely loved Dark Places. I haven't seen Gone Girl yet but I really hope they stay true to the book when they do Dark Places. I am also a huge fan of Ransom Riggs. Not sure how I feel about Burton directing Miss Peregrine but we'll see! Yes, that Miss Peregrine movie could be very interesting! Glad to hear you liked Dark Places so much. I'm looking forward to it! I knew about the first few but hadn't heard about Room or Light Between Oceans - two of my favorites! Sounds great - can't wait to see them! Yes, they've been going crazy adapting books into movies the past few years! Gives them a built-in fan base, I guess. It's more unusual now for a movie to be based on an original screenplay not adapted from a book! It does seem like it's become more common to adapt from books instead of writing an original screenplay. I suppose there are so many books to start from, why start from scratch!